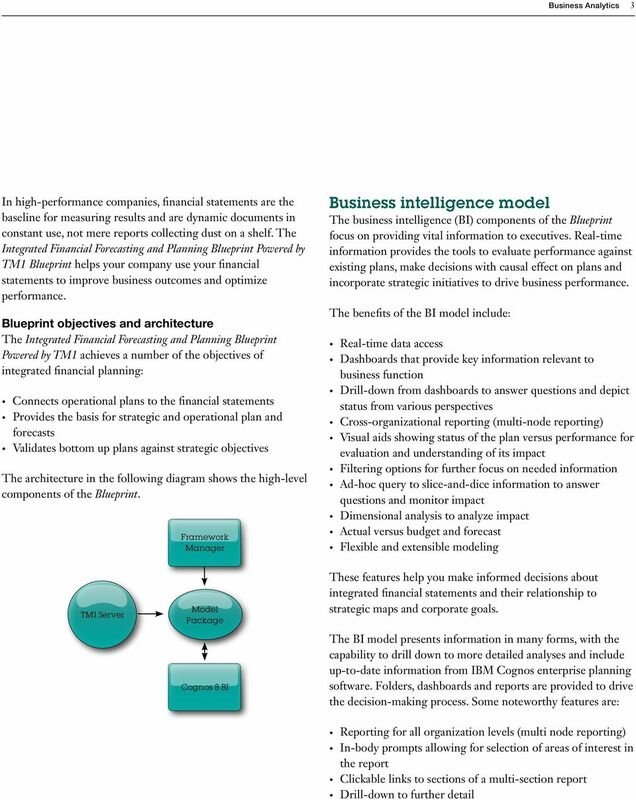 Download "Integrated Financial Forecasting and Planning Performance Blueprint Powered by TM1"
2 2 Integrated Financial Forecasting and Planning Performance Blueprint Powered by TM1 Introduction This application brief illustrates a Web-based application for managing integrated financial statements. 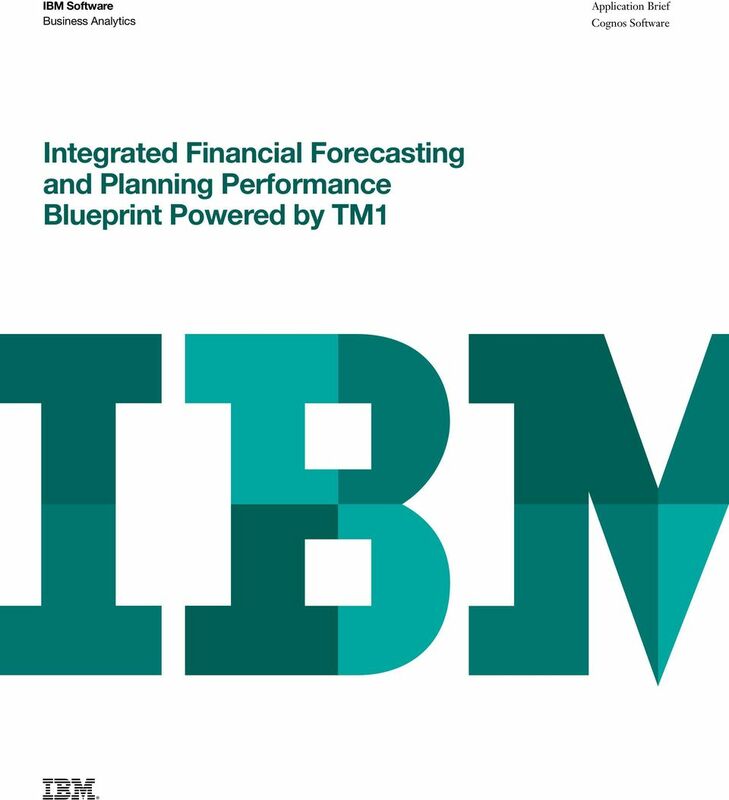 The IBM Cognos Integrated Financial Forecasting and Planning Performance Blueprint Powered by TM1 enables operations to focus on plans while affording finance and senior management the visibility to ensure that operational plans are in synch with corporate objectives. The Blueprint establishes the targets and metrics used to measure organizational success. Response to changing business conditions is usually expressed as an updated forecast. As forecasts change, integrated financial statements can be instantly updated to see the effect on key financial objectives such as DSO and cash flow per share. 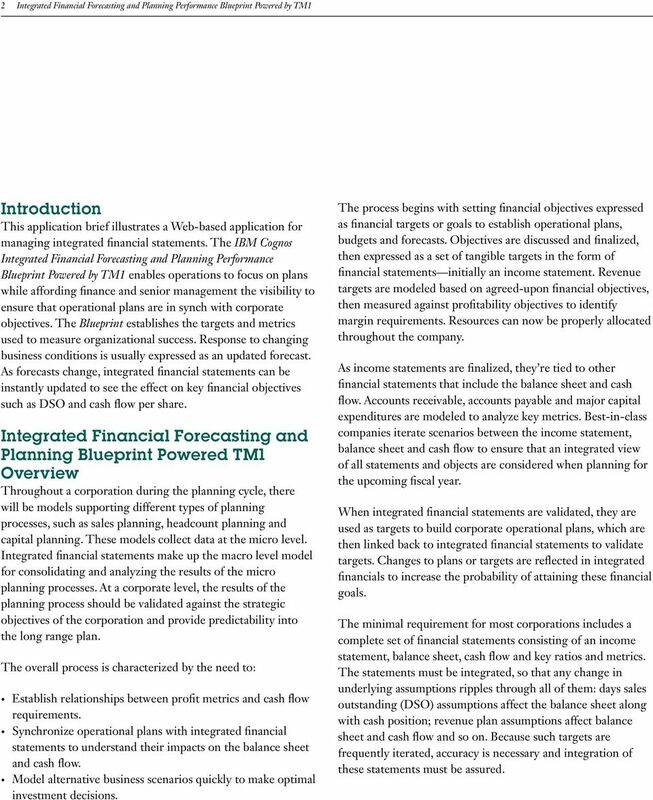 Integrated Financial Forecasting and Planning Blueprint Powered TM1 Overview Throughout a corporation during the planning cycle, there will be models supporting different types of planning processes, such as sales planning, headcount planning and capital planning. These models collect data at the micro level. Integrated financial statements make up the macro level model for consolidating and analyzing the results of the micro planning processes. At a corporate level, the results of the planning process should be validated against the strategic objectives of the corporation and provide predictability into the long range plan. The overall process is characterized by the need to: Establish relationships between profit metrics and cash flow requirements. Synchronize operational plans with integrated financial statements to understand their impacts on the balance sheet and cash flow. Model alternative business scenarios quickly to make optimal investment decisions. The process begins with setting financial objectives expressed as financial targets or goals to establish operational plans, budgets and forecasts. Objectives are discussed and finalized, then expressed as a set of tangible targets in the form of financial statements initially an income statement. Revenue targets are modeled based on agreed-upon financial objectives, then measured against profitability objectives to identify margin requirements. Resources can now be properly allocated throughout the company. As income statements are finalized, they re tied to other financial statements that include the balance sheet and cash flow. Accounts receivable, accounts payable and major capital expenditures are modeled to analyze key metrics. 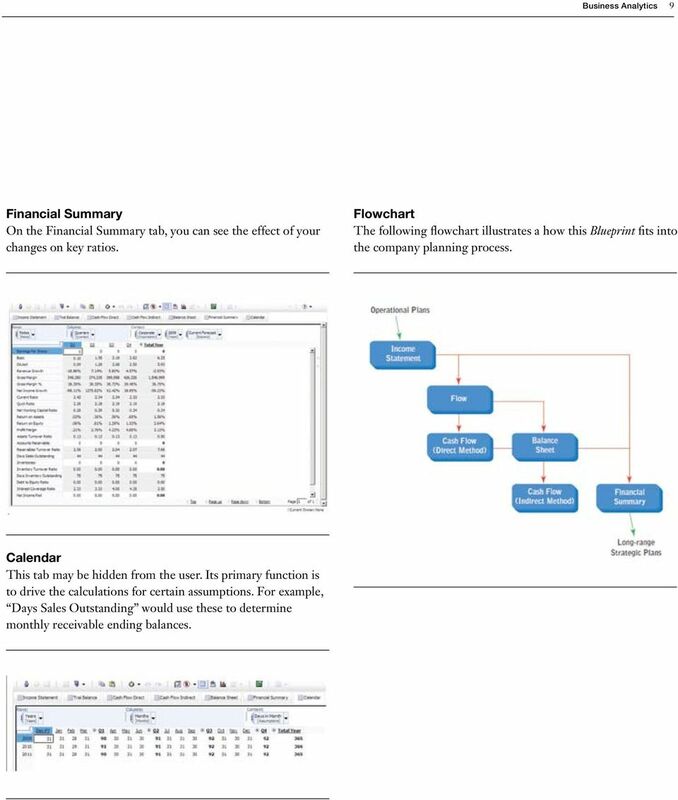 Best-in-class companies iterate scenarios between the income statement, balance sheet and cash flow to ensure that an integrated view of all statements and objects are considered when planning for the upcoming fiscal year. When integrated financial statements are validated, they are used as targets to build corporate operational plans, which are then linked back to integrated financial statements to validate targets. Changes to plans or targets are reflected in integrated financials to increase the probability of attaining these financial goals. The minimal requirement for most corporations includes a complete set of financial statements consisting of an income statement, balance sheet, cash flow and key ratios and metrics. The statements must be integrated, so that any change in underlying assumptions ripples through all of them: days sales outstanding (DSO) assumptions affect the balance sheet along with cash position; revenue plan assumptions affect balance sheet and cash flow and so on. Because such targets are frequently iterated, accuracy is necessary and integration of these statements must be assured. 4 4 Integrated Financial Forecasting and Planning Performance Blueprint Powered by TM1 Workflow In a typical workflow, after a company has set its strategic objectives, the rest of the organization uses the targets to create tactical operational plans for the upcoming year. These operational plans are typically driver-based and linked to key business factors such as number of units sold, product mix and so on. After plans are reviewed and approved, they are tied back to integrated financial statements to ensure they meet corporate objectives. 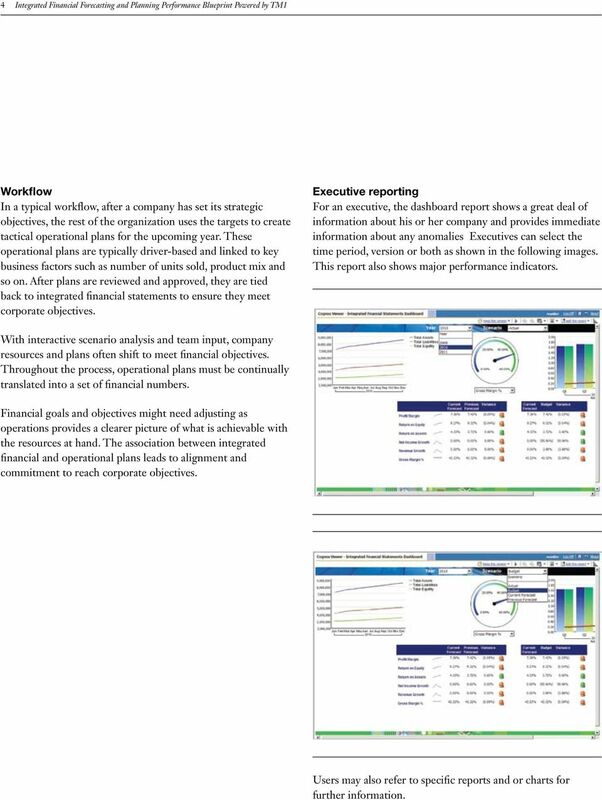 Executive reporting For an executive, the dashboard report shows a great deal of information about his or her company and provides immediate information about any anomalies Executives can select the time period, version or both as shown in the following images. This report also shows major performance indicators. With interactive scenario analysis and team input, company resources and plans often shift to meet financial objectives. Throughout the process, operational plans must be continually translated into a set of financial numbers. Financial goals and objectives might need adjusting as operations provides a clearer picture of what is achievable with the resources at hand. The association between integrated financial and operational plans leads to alignment and commitment to reach corporate objectives. Users may also refer to specific reports and or charts for further information. 5 Business Analytics 5 For example, they can refer to an income statement chart similar to the chart in the following example. Users can also view a balance sheet. 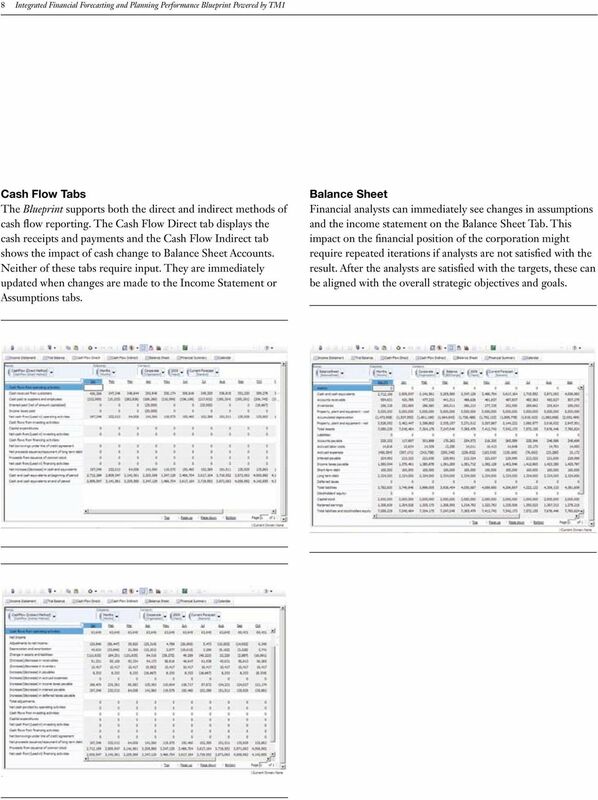 Information about direct and indirect cash flow is also displayed in the Cash Flow Direct and Cash Flow Indirect reports. 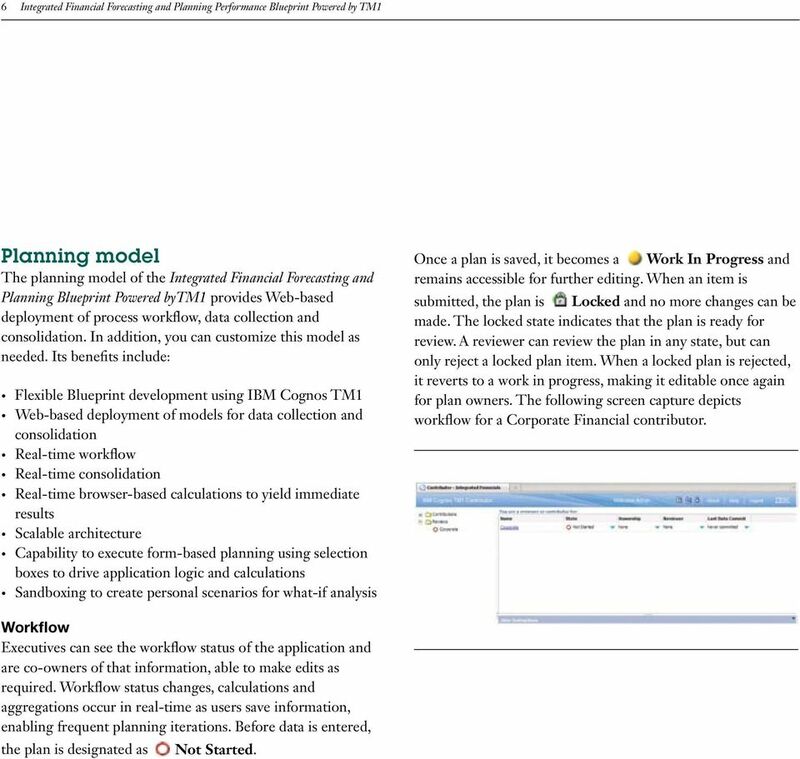 6 6 Integrated Financial Forecasting and Planning Performance Blueprint Powered by TM1 Planning model The planning model of the Integrated Financial Forecasting and Planning Blueprint Powered bytm1 provides Web-based deployment of process workflow, data collection and consolidation. In addition, you can customize this model as needed. Its benefits include: Flexible Blueprint development using IBM Cognos TM1 Web-based deployment of models for data collection and consolidation Real-time workflow Real-time consolidation Real-time browser-based calculations to yield immediate results Scalable architecture Capability to execute form-based planning using selection boxes to drive application logic and calculations Sandboxing to create personal scenarios for what-if analysis Once a plan is saved, it becomes a Work In Progress and remains accessible for further editing. When an item is submitted, the plan is Locked and no more changes can be made. The locked state indicates that the plan is ready for review. A reviewer can review the plan in any state, but can only reject a locked plan item. When a locked plan is rejected, it reverts to a work in progress, making it editable once again for plan owners. The following screen capture depicts workflow for a Corporate Financial contributor. Workflow Executives can see the workflow status of the application and are co-owners of that information, able to make edits as required. Workflow status changes, calculations and aggregations occur in real-time as users save information, enabling frequent planning iterations. Before data is entered, the plan is designated as Not Started. 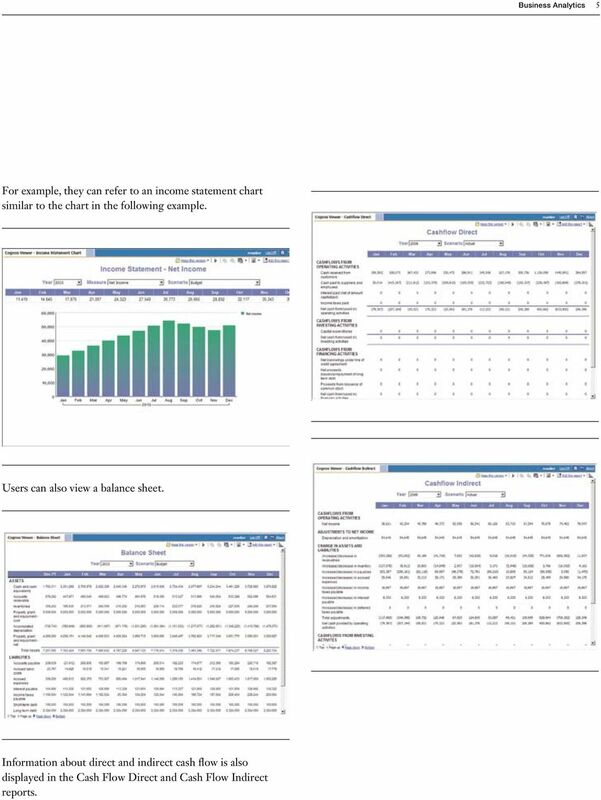 7 Business Analytics 7 Income Statement The Income Statement is fed by bottom-up plans developed in other Blueprints, such as the Expense Planning and Control Blueprint. A financial analyst can compare these bottom-up plans to actual data, the current forecast and the previous forecast. The analyst can easily transfer data from the current forecast to the previous forecast and create a new current forecast. The first view of the income statement shows the current monthly forecast for The second view shows a chart and bar graph. You can create any number of views and graphs on the fly. 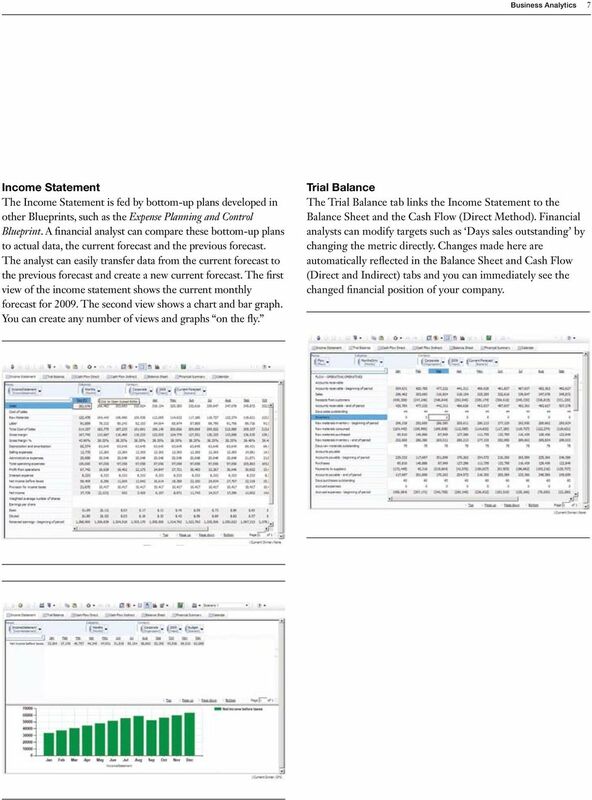 Trial Balance The Trial Balance tab links the Income Statement to the Balance Sheet and the Cash Flow (Direct Method). Financial analysts can modify targets such as Days sales outstanding by changing the metric directly. Changes made here are automatically reflected in the Balance Sheet and Cash Flow (Direct and Indirect) tabs and you can immediately see the changed financial position of your company. 8 8 Integrated Financial Forecasting and Planning Performance Blueprint Powered by TM1 Cash Flow Tabs The Blueprint supports both the direct and indirect methods of cash flow reporting. The Cash Flow Direct tab displays the cash receipts and payments and the Cash Flow Indirect tab shows the impact of cash change to Balance Sheet Accounts. Neither of these tabs require input. They are immediately updated when changes are made to the Income Statement or Assumptions tabs. Balance Sheet Financial analysts can immediately see changes in assumptions and the income statement on the Balance Sheet Tab. This impact on the financial position of the corporation might require repeated iterations if analysts are not satisfied with the result. After the analysts are satisfied with the targets, these can be aligned with the overall strategic objectives and goals. 9 Business Analytics 9 Financial Summary On the Financial Summary tab, you can see the effect of your changes on key ratios. Flowchart The following flowchart illustrates a how this Blueprint fits into the company planning process. Calendar This tab may be hidden from the user. Its primary function is to drive the calculations for certain assumptions. For example, Days Sales Outstanding would use these to determine monthly receivable ending balances. 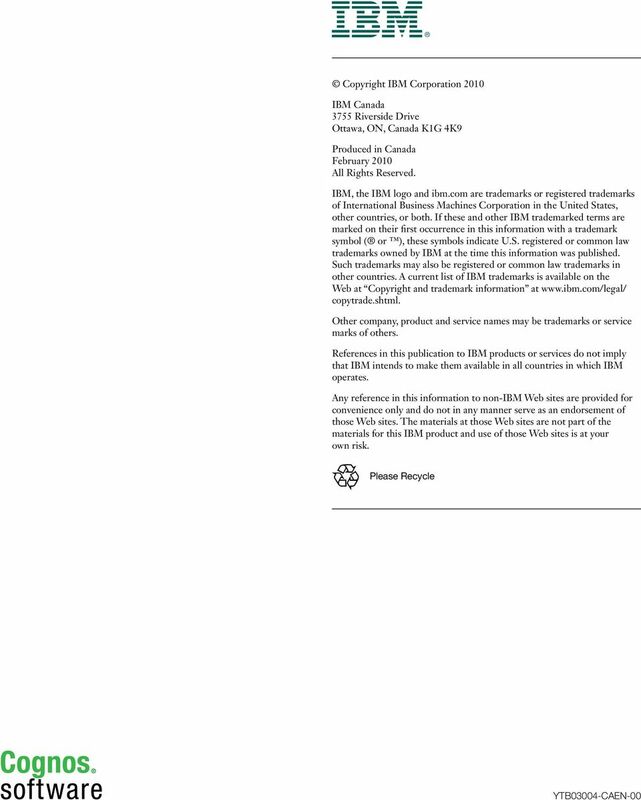 10 10 Integrated Financial Forecasting and Planning Performance Blueprint Powered by TM1 About the IBM Cognos Innovation Center for Performance Management The IBM Cognos Innovation Center was established in North America and Europe to advance the understanding of proven planning and performance management techniques, technologies, and practices. The Innovation Center is dedicated to transforming routine performance management practices into next practices that help companies cut costs streamline processes boost productivity enable rapid response to opportunity increase management visibility Staffed globally by experts in planning, technology, and performance and strategy management, the Innovation Center partners with more than 600 IBM Cognos customers, academicians, industry leaders, and others seeking to accelerate adoption, reduce risk, and maximize the impact of technologyenabled performance management practices. 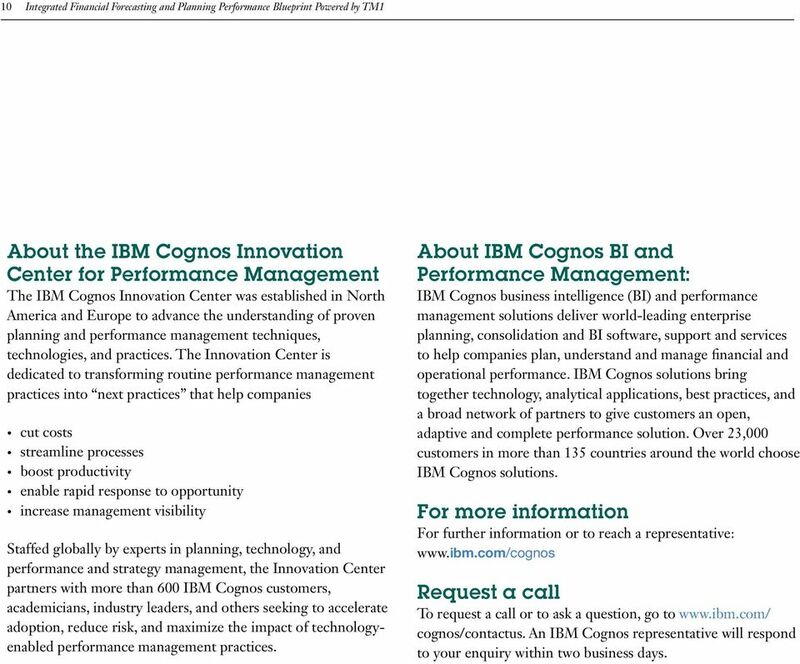 About IBM Cognos BI and Performance Management: IBM Cognos business intelligence (BI) and performance management solutions deliver world-leading enterprise planning, consolidation and BI software, support and services to help companies plan, understand and manage financial and operational performance. IBM Cognos solutions bring together technology, analytical applications, best practices, and a broad network of partners to give customers an open, adaptive and complete performance solution. Over 23,000 customers in more than 135 countries around the world choose IBM Cognos solutions. For more information For further information or to reach a representative: Request a call To request a call or to ask a question, go to cognos/contactus. An IBM Cognos representative will respond to your enquiry within two business days.